By combining a common 78L05 with an integrated audio amplifier of the type TDA2030, an adjustable voltage regulator can be constructed in a very simple manner that works very well. 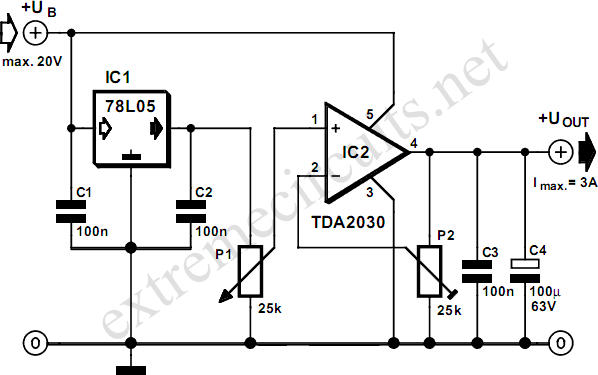 The output voltage is adjustable up to 20 V, with a maximum current of 3 A. Since the TDA2030 comes complete with a good thermal and short-circuit protection circuit, this adjustable regulator is also very robust. 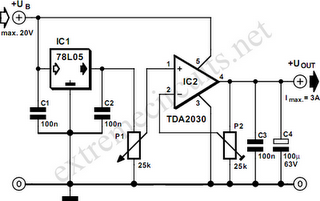 As illustrated by the schematic, the design of this circuit is characterized by simplicity that is hard to beat. In addition to the two ICs, the regulator contains actually only two potentiometers and a few capacitors. The adjustment is done by ﬁrst turning potentiometer P1 to maximum (wiper to the side of the 78L05) and subsequently turning trimpot P2 until the desired maximum output voltage is reached. P1 is then used to provide a continuously adjustable voltage between this maximum and nearly zero volts. At relatively small output currents there are no specific requirements regarding the cooling. However, when the output current exceeds 1 A, or if the input to output voltage difference is quite large, the amplifier IC has to dissipate too much power and a small heatsink is certainly appropriate.